"You know, even now that you have explained to me, how hyper-modern-art works, I still don't quite get it. I mean, the image is just... monochrome. I really prefer more colour in art." "Ah, but that's not a problem my friend. Just come with me and look at another painting from the same artist. See, more than enough colours"
Why on earth are you chuckling now?" "It's just that I found your comment rather funny. In particular, if you look at the title of this painting..."
"Oh!! I see. Well, I can see why it is funny, but I can absolutely not see, why this work is called like this!" "Well, well, my friend. Sometimes you have to look beyond what is visible, connect the facts and combine all in an intuitive way. You know Rebus puzzles, don't you? See, this painting really is just a somewhat more involved variant. But you were right in one thing. The stripes are without any meaning." The goal of this puzzle is to find the title of the work, which is a single word. The puzzle is fully contained in the image. You may want to download the full-size version for processing. The puzzle can be solved with a printed version of the image above. The puzzle requires an action and is (likely) not being solved by just looking at the picture. Read the following after you think you have the solution. Note, that if you base your solution by guessing on the information below, you have not solved the puzzle. The facts below should not be part of your solution. There are 20 pairs of identical symbols, which can be connected by lines. We can find the intersections of the lines from the same colors, producing 10 points. We can also intersect lines which connect the same shapes, which produce another 10 points. The intersection points spell out "IQ". 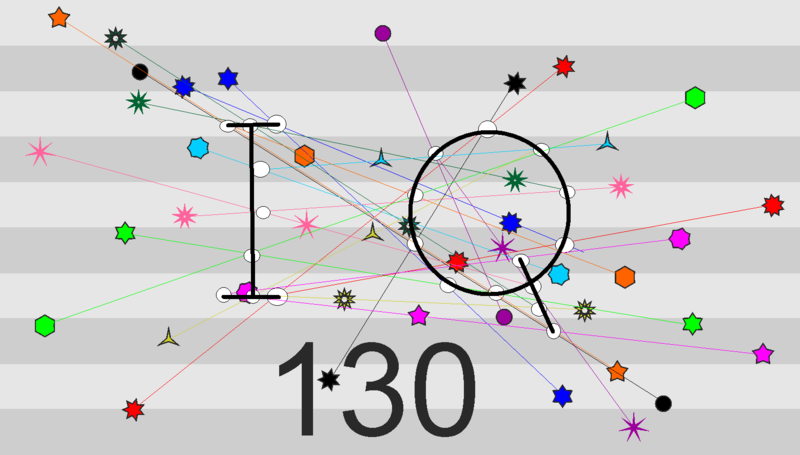 "IQ over 130", which describes a genius. 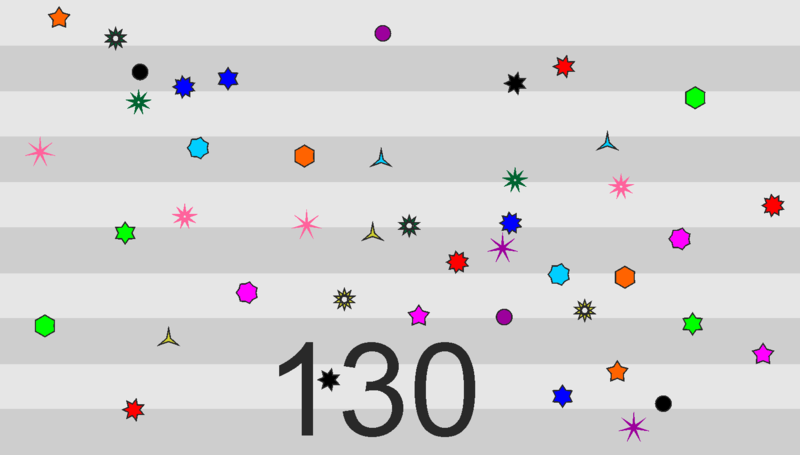 There are ten colors of stars and ten shapes of stars. Each color appears four times and each shape appears four times. The numbers at the bottom resemble a clock so, instead of being QUARTS, it is QUARTZ. 1) The stars. What is the significance of the shapes? BmyGuest has hinted that the stripes have no significance, but did not say that the stars are without significance; to me, this has the reverse-psychological effect of saying "The shape of each star is important." There are exactly 4 of each specific shape, and all of the shapes are the same size. It could be that it has something to do with the number of points on each shape. If there's a mathematical proportion involved, then the circles would probably eliminate multiplication processes. 2) The colors. The colors obviously mean something, or else it would not have been important for the characters in the story to notice them. There are 11 colors (if you count black as a color), and there are exactly four shapes of each color, split into pairs of two. The significance of this is uncertain. If you don't count black as a color, then it could be that the goal of the image is to figure out what color they should be by pattern analysis. 3) Their positions. The stars are all scattered about on the image. Their positions may or may not be arbitrary - this might be the significance of using stars, in that the shapes have a clearly defined center point - but if this puzzle can be solved without computer assistance, then their exact pixel definitions are probably unneeded. 4) The number at the bottom. The number shows 130. What does the number signify? It probably has something to do with the Rebus aspect of the puzzle, but anything farther than that I have not yet determined. 5) The solution itself. Some hints were given about the solution. For one, the word must be a word. This means it will have proper spelling. Secondly, it has exactly 6 letters. This may mean that we must deduce each of the six letters independently. Lastly, all 6 letters will be different. SQUARE. It satisfies the conditions of the 5th point mentioned above. I picked Square because among the 2-dimensional shapes present in the image, the square has been skipped over. Arguably, the pentagon and multiple other shapes have also been skipped, and perhaps the closest 4-sided figure to a star would be a diamond/rhombus, but those do not have exactly six letters. More thought will be needed. Not the answer you're looking for? Browse other questions tagged cipher rebus visual or ask your own question.